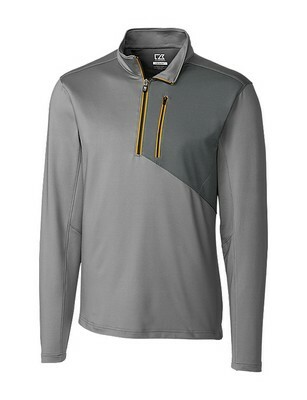 Our Men's Shaw Hybrid Half Zip features half zip, moisture and UV protection which act as attention grabbing custom product. Stand out in style at the next corporate event with this Men’s Shaw Hybrid Half Zip pullover that combines elegance with the perfect sporty performance to impress your valuable customers. This outfit will certainly attract your recipients towards your brand for the comfort and weather protection it offers in all seasons. Specially designed for outdoor activities, this pullover is made of polyester-spandex French terry with moisture wicking properties to keep the person dry and cool all day. Mock neck and chin guard ensure that you stay safe and protected during your favorite sports. Exposed half zipper, silver heat transfer detail and stripped collar ribbing make the outfit stand out in style. 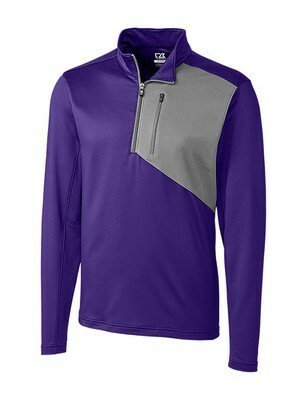 Imprint your custom logo on this modern outfit to leave a lasting impression on your recipients with your personalized promotional giveaway!